EDIT: This Bill Gray’s is closed, but others live on to serve you garbage. While I was lucky enough to get out to Rochester to get a Garbage Plate from the source, my roommate was not so lucky. To make up for it, we went on a quest for a plate in Buffalo. This first took us to University Hots, which a friend of mine lauded but appeared to have relocated or changed names or something confusing like that. 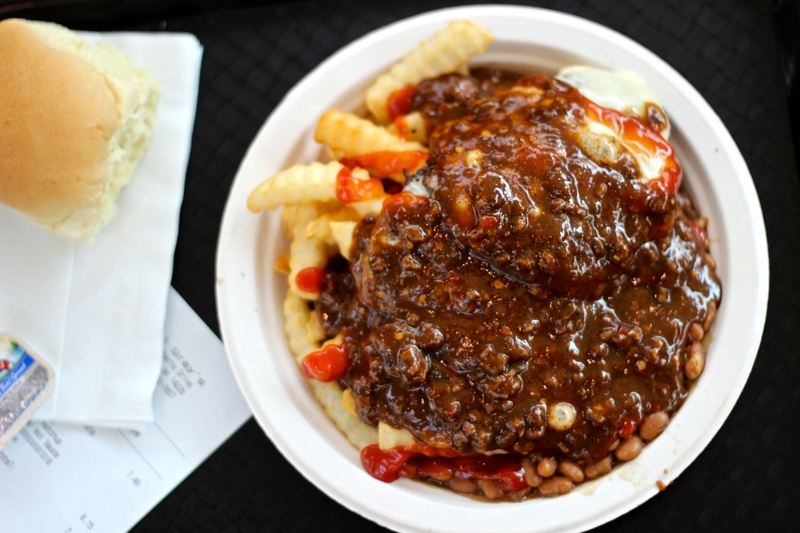 So, since this was late-afternoon and we weren’t in the typical drunken state of mind it takes to eat a Garbage Plate, we drove over to Bill Gray’s. Bill Gray’s started out near Rochester and has a couple locations in Buffalo. We went with the Amherst version that is actually located in a mall food court. It was “happy hour,” so their “Great Plates” were at a discount. The options were more limited than Wimpy’s, but I could still make it my own. I went with two cheeseburgers, fries and baked beans, plus their spicy meat sauce and ketchup. For starters, it was weird eating this sober. It doesn’t change the fact that the idea is genius, but it does take some of the fun out of it. And while I can’t totally blame Bill Gray’s for this, I can at least a little because they chose to be in a mall food court. The burgers were a bit juicier than those at Wimpy’s, and the baked beans were the same, but the fries and sauce weren’t quite as good. Yet, Bill Gray’s was certainly not a disappointment. I’m no Garbage Plate expert, but at the end of the day Wimpy’s just felt and tasted better than Bill Gray’s. Perhaps it was the sterile environment of a mall food court or the lack of alcohol in my body, but Bill Gray’s put together a good, not great, plate.